Web design is complicated and dynamic. It combines different areas of knowledge that affects heavily how its target market sees the information given or make them want what you are offering. If you want the store to look excellent and have good conversion rates, the design plays an important role on this matter. Take note that this applies to both visual and simple to use (easy to browse, easy to search, easy to find, and easy to buy). Why is important to know the trends? The competitive edge and quality of a business depends highly on the quality and well planned web design. The Internet is refreshed constantly with new websites and web developers, causing high competition and website owners battling for popularity and high performance of their resources. Nowadays many buyers feel that a website's design is an important factor that affect if they trust or not your business. When it comes to designing your shop, don't think that an ordinary plain design will do, you won't be remembered. This one is a "gimme". It has been the trend for few years and it's not slowing down. If your store is not designed for the mobile user (smartphones & tablets) in any way (not even a mobile template version to detect mobile user), you are letting a lot of customers just pass by your door without even looking at what you have to offer. For a while soft tones and monotones took over designs but that is a thing of the past. If you take a look at the latest fashion collections you will see a tendancy to bright neon colors. Remember that certain colors evoke certain emotions so be careful; also keep in mind your brand ALWAYS when it comes to color. Combined usually with the vibrant colors. Don't only think about logos but textures, fashion presentation, backgrounds, etc. Again, don't forget about your brand, if using a shape, try to use one that could represent your brand somehow. It doesn't matter if it's an intro of your business, a product presentation or a tutorial. Videos are being used more and more on ecommerce. They don't need to be long, even a 15-20 seconds video showing your product goes a long way. Using white space gracefully, hamburger menus and unique fonts will create the best environment that your visitor needs to focus on finding that product or service they are looking for in your virtual store. All these combined with your great customer service, awesome products and fast shipping will make it a pleasant experience they will remember next time they need to buy again. The engagement of the user by the natural human desire of acknowledgement. What am I talking about? a button that says "press here to see the status of your order", highlight changes, call to action, the view will change after pressing or interacting somehow with the button/image/element. There should be a harmony in the whole process of clicks through to make it a success but the basics are that the button should be catchy, provocative and not easy to miss. Say to your visitors exactly what they need to do in that page, like "Click here for more info", "Buy Now", "Register for a free...", "Share", etc. Do you remember when people didn't like to scroll and you will try to put the most of the information on "the fold" of the page? :)) Well, today is completely the opposite. People love to scroll and scroll and scroll (not me though). You have to know very well your customers if you are thinking to implement this one; because it could be annoying if they don't like this type of browsing. This is why Facebook, Twitter and Pinterest have huge user engagement. Also since the whole list doesn't load at once and it will do it periodically as you scroll, doesn't affect your loading time. These trends are based of what have been happening on the past 12 months but they are not much different than 2 years ago. Let's see what 2019 bring us on the eCommerce space. 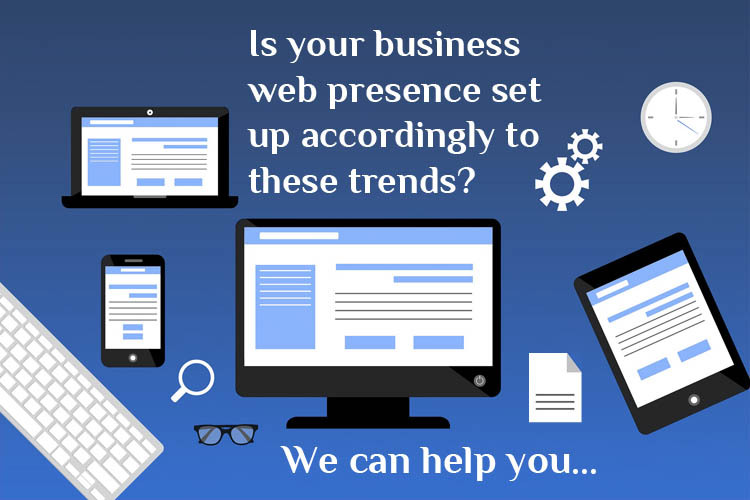 So tell me...Is your business web presence is set up accordingly to these trends?